by Dean Valerio No one’s reading your content. No one’s reading your content. That’s exactly what you’re thinking because it’s been a week and no one’s visiting your blog, sharing it or commenting on it. And it’s not like you’re still trying to work out how to get your post to line up with your social media followers. You know what they like, you know what they share, but you have a feeling you also know why no one’s reading your content. And no matter how many hours you take crafting the perfect headline, you have no idea how to make it more powerful to entice readers. Even if your headline isn’t attention-grabbing, there are hacks that’ll help you get around this. Why all the fuss over a headline? Because your headline is that important in your content marketing strategy. Most people will never read your post. Up to 80% of people will take one look at the headline and if it doesn’t capture them, there’s no way they’ll stay to read the rest of what you have to say. And what happens if the stars align and you have the perfect headline? It can make up to a 500% difference in your traffic. Yes, headlines can make your post go viral. So, how can you capture your readers with a tantalizing and attention-grabbing headline? People are seekers. They come online to learn something or try to solve a problem. Your headline must fulfill that curiosity. If you can do that, then people will click through and see what you have to say. But, knowing that it only takes one thing doesn’t mean it’s easy. 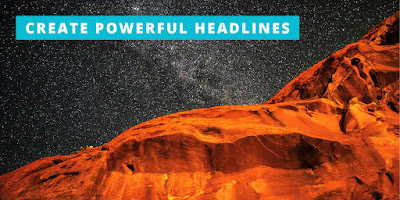 Here are four ways you can create powerful headlines that get read. How come your partner can tell you you’re beautiful every day, but the one time they mention an imperfection you’re all over them? For some reason, our brains hold onto and remember all the negative things instead of the positive things. Our brains process and analyze negative experiences longer than positive ones. And this is no different online. If you position your headline with negative superlatives – won’t, avoid, worst – you can attract 63% more readers. Looking on BuzzSumo, you can see that using the word avoid in headlines can bring a lot of shares. A number in a headline makes it final. It creates a box around the idea and attracts people who want to open the box. Makes you want to see what those fifteen ways are, right? What’s great about creating a listicle type post is that it will get shared more often than a non-numbered headline post. What else does a number do to a reader? It makes it specific – People like to read something specific and that has boundaries. So, if the headline promises 53 ways, they have an idea of the length and what they’re getting into with the post. It allows for scanning – Believe it or not, people don’t read word for word; they scan content looking for the important things. And numbers create signposts that help them navigate and find the valuable content in your post. Our brains enjoy numbers – That’s right. We are genuinely attracted to numbers. It acts as an organizational system, and we all know people love lists. But, does any number work for your headline? Not really. The best numbers to use are odd numbers. It’s been shown that odd numbers hold your reader’s attention more. As an example, 3 Ridiculous Mistakes People Make When Using Social Media. Remember, people are online to solve a problem or learn something new. Your headline can help them to their goal – if it makes a promise. You can even make an almost crazy promise to your readers. You want your headline to shock your reader. His headline is implying that you have the same tools as Neil had to create a multimillion-dollar company. 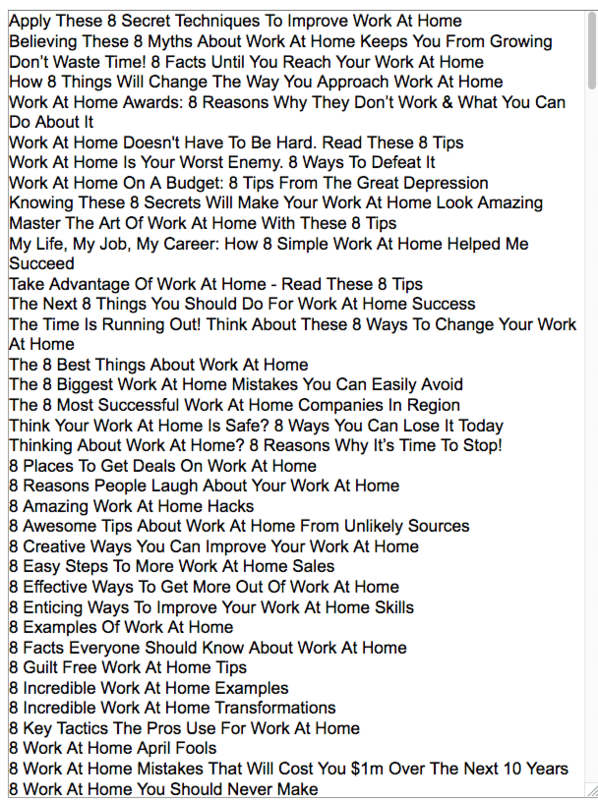 You see these promise-type headlines a lot on sales pages and landing pages. You only have a few seconds to get your visitor’s attention and entice them to follow your call to action. 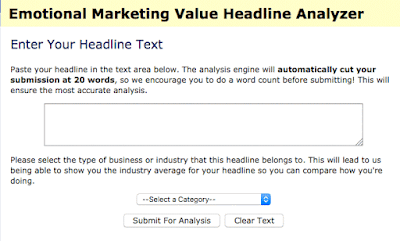 We all know that crafting your own headlines is ultimately the best way, but if you’re struggling or have a bad case of writer’s block, there are headline generator tools and analyzers to help you out. Let’s look at three of the most popular ones. The CoSchedule Headline Analyzer takes your headline and gives it several ratings and scores. While this tool doesn’t generate a headline for you, it does help you create a converting headline that will entice readers and make them invest in your content. 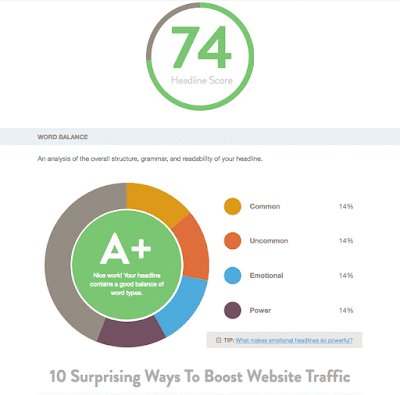 Let’s look at an older Snaptactix headline: 10 Surprising Ways to Boost Website Traffic. This headline gets an A+ because of its use of uncommon words, emotional words and power words. CoSchedule also likes that this post is a list post and that the character and word count are a good length. If you receive a low score, you can find out what metric is scoring poorly. 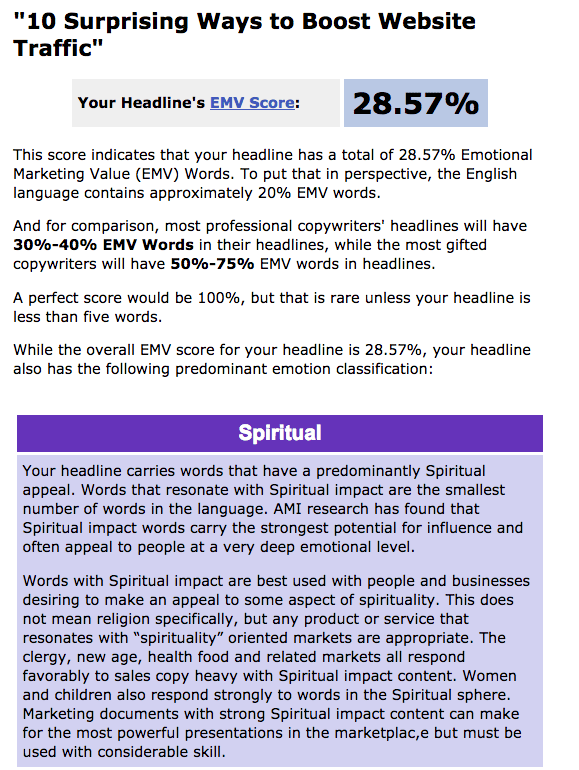 For example, you may lack emotional type words and may need to increase those words in your headline. 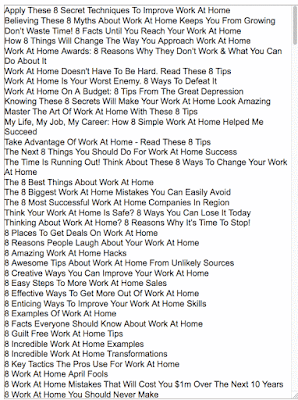 Do you want hundreds of titles based on a keyword? 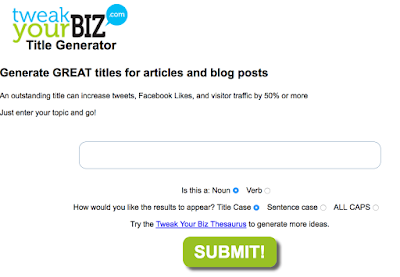 Well, the Tweak Your Biz Title Generator will give you over a hundred titles based on several categories. Not every result will make sense, but there are a lot of headlines that totally work and can inspire you towards a usable and engaging headline. 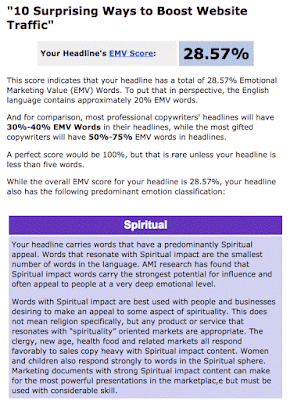 The Emotional Marketing Value Headline Analyzer looks at the impact your headline will have on your readers. 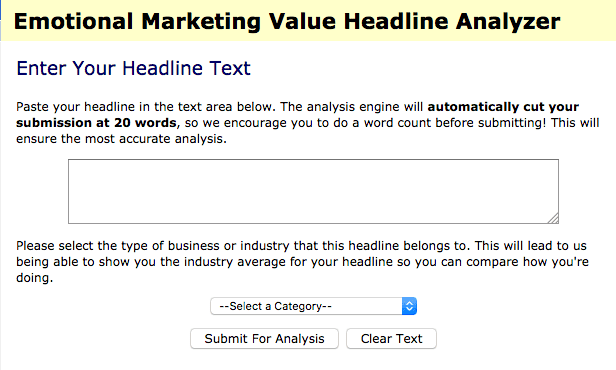 Paste your headline into the box, select a category and submit for analysis. Looking at the headline we used for the CoSchedule Headline Analyzer, the results from this tool gives us some different ideas about the headline. This headline is more suitable for health food markets than content marketing businesses for some reason. But, that doesn’t mean your headline isn’t effective. It will still resonate on social media, according to CoSchedule’s ratings. While your headline is important, so is the content. And, as you know, you should spend 80% promoting what you created and 20% creating it. 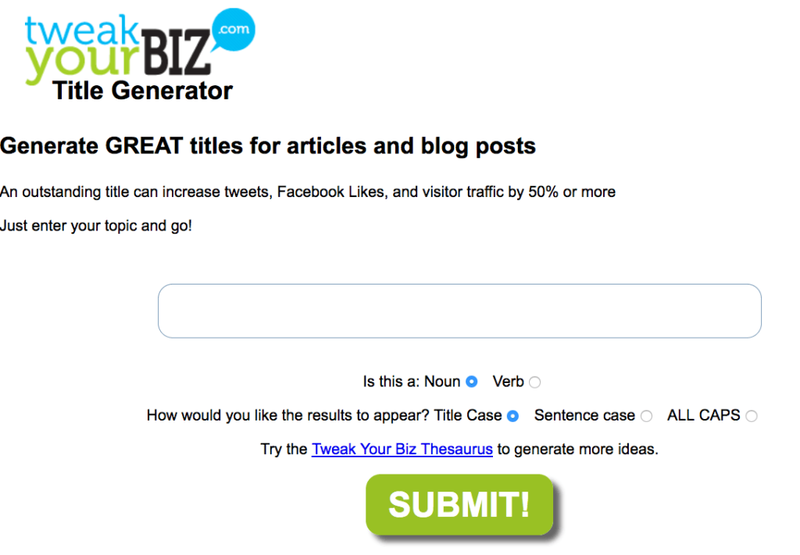 Or, use a tool like the Tweak Your Biz Blog Title Generator to see hundreds of potential headlines quickly. You can also dive deep and analyze a headline with the CoSchedule Headline Analyzer or the Emotional Marketing Value Headline Analyzer. Or, if a formula is something you enjoy using more, take a look at the two formulas in this post to help you craft that perfect headline. And no matter if you use a headline formula, tool or template, understand that creating a headline is important, but it shouldn’t take up all of your time. Over to you – tell us what is your favorite method for creating engaging and powerful headlines?